You can’t go wrong with either Jessica Mitford or H.L. Mencken so this was a very lucky draw for me. Actually, I stacked the deck a bit for this my second round with the Deal Me In Short Story Challenge, lots of Mitford and lots of Mencken in my current deck. This match up was bound to happen. I drew Jessica Mitford’s 1961 essay “Proceed with Caution” about what it’s like to drive cross-country in America. Mitford brings an outsider’s perspective to this topic which makes for a charming little piece. While she doesn’t reveal anything terribly insightful about American life, she does present a pretty darn accurate idea of what it was like to drive our highways in 1961. I’m guessing it’s accurate since it was a few years before my time because it sounds like the road trips I remember from my own childhood. Nothing in your previous experience will have prepared you for the turnpikes, freeways, thruways, skyways you will encounter in America–particularly if you are, as I was, a Londoner. The actual sensation of highway driving in America is that of traffic whizzing slowly. This contradiction is achieved by getting up to the legal limit (50, 70 or 80, depending on the state) and staying there–which is precisely what every other car is doing. For hours and hours you drive at this speed, with no necessity for slowing, accelerating, or changing gear–you are alone on your track, like Yuri Gagarin in his space capsule. Yes, she is talking about driving the highways of the American West. Sounds just like I-5 to me. I’ve only driven the highways in France and Portugal, but neither of these really compared with those here in the U.S. We do road trips like no one else. It takes a long road to cross a big country. Mencken’s essay was much more esoteric, “The Criticism of Criticism of Criticism.” Written I 1919, Mencken gives a very entertaining overview of the state of artistic criticism which was caught up in a debate over the purpose of both art and criticism. Should art be instructive, moralistic in nature and how should the critic respond to art that is not so moral. This question really isn’t that far from what so many people argue about today when they question how inclusive various art forms are. The moral issues that interest us are not exactly the same ones that interested critics and artists in 1919, but they’re similar enough to make Mencken’s essay relevant. While Mencken does not side with the moralists, he is not entirely opposed to them either. He does see a very useful place for critics which he outlines in his final paragraph. So how can I connect an essay on the nature of criticism with one on the great American road trip? One thing that struck me about both essays is how timely they each are in spite of being 50 to 100 years old. Mitford’s road trip is still the road trip most Americans take. Mencken’s questions about the purpose criticism is still the one I wonder about when I wonder about why I’m doing this book blogging thing. 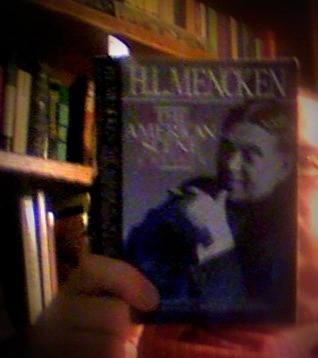 And I like Mencken’s answer. And Mitford’s essay has me itching to take the new care out for a very long drive. I do like Mencken’s idea but it seems to leave out the fact that the reader might have their own view as well and can then engage in a debate with that critic’s interpretation. I find that the most useful criticism for me is either further illuminating something I like, or making me defend my views on a text a critic has savaged. Mencken does pre-date reader response theory, but I think the end product you talk about is a “spectator” with a greater understanding of the artwork which is just what Mencken says should be the goal of a good critic.